As the COO of Diet Doctor and low-carb enthusiast for years, you would have thought I’d nailed ketosis years ago. I haven’t, and here’s why. Am I still in ketosis? To get into ketosis, the most important thing is to eat maximum 20 grams of digestible carbs per day. When I went low carb in 2012, I followed that advice to the letter – replacing all high-carb foods like potatoes, bread, rice, pasta, legumes, fruit, juice, soda, and candy, with eggs, dairy, meat, vegetables, fats and berries – counting every carb I consumed. I felt great – effortless weight loss, no stomach issues, tons of energy and inspiration. But over time, something changed – I no longer felt as great as I used to. Until recently, I had no idea why. The journey to find out started with a simple question: Am I still in ketosis? At a Diet Doctor dinner a while ago, our CTO, Johan, gently challenged me. “Bjarte, you’re eating quite a lot of protein. Have you measured your ketones lately?”. “No”, I said, feeling slightly defensive, “I’ve never measured my ketones. Should I?”. Johan and I grabbed two blood-ketone meters from a dusty drawer, pricked a finger each, and touched the ketone strips. His results came out first – 3.0 mmol/L – optimal ketosis. He looked happy. How could I not be in ketosis? It was my turn. The ketone meter made a weird beeping sound and the screen started blinking – 0.0 mmol/L – no ketosis whatsoever. What?! I’d been eating strict low carb for years, how could I not be in ketosis? I felt slightly embarrassed, but mainly relieved. Was this the reason I no longer felt great? Several of my colleagues agreed with Johan – I was eating too much protein. To test that hypothesis, I started a 10-day-protein-reduction experiment in April, eating a maximum of 60 grams of protein a day (down from around 80-120). This sucked, as I love eggs, cheese and meat. Around 40-45 grams of protein, mainly from meat and eggs. Having eaten strictly low carb AND low protein for ten days, I pricked my middle finger and put my blood on the keto strip. Beeeeep! The screen was blinking – 0.0 mmol/L. Nothing. No ketosis whatsoever. My colleagues and I had been wrong – too much protein wasn’t the culprit. It was time to test my carb intake – was I really eating less than 20 grams a day? I was ready – the carb-counting could begin. How many carbs was I eating? Am I eating less than 20 grams of carbohydrate a day? Day one was my calibration day. Eating more or less like I had done lately, how many carbs would that add up to? I was in for a surprise. 30 grams of digestible carbs, 50% more than recommended. I couldn’t believe my own stupidity. This must be the reason I’m not in ketosis, I thought. On April the 22nd, at 07:52 am, I pricked my finger, touched the ketone strip, and waited. It was now or never. For the last two days I’d felt the typical symptoms of getting into ketosis, dry mouth and increased thirst for example. But, getting the confirmation felt great – blood doesn’t lie. I continued to eat like this for about a week. Every morning, as soon as I woke up, I would measure my ketones, and every morning I would be in ketosis. It had been the carbs all along. I’ve been in ketosis for a few weeks now and it feels great. I’m delighted to be back. Do you want to stay in ketosis? Then count your carbs – at least every now and then. The above is the first of a 3-part blog series. Here’s the next one: How much protein can you eat in ketosis? I thought there was no counting on this diet, but it turns out there is - you're just not counting calories but carbs. Frustrating. What was the reason you wanted to be in Ketosis again? Is it a good thing in and of itself? I know of most of the benefits (e.g. helps with weight loss, can reduce fatty liver, gets blood sugar down, can reverse T2D, etc.) but once you reach the point where all of those health markers are back to normal, what's the advantage of actually being in Ketosis vs. just staying healthy and eating a low to moderate carb diet?. It's going to cost ya but it's worth it ?. Wow. Thank you for the insight. Looks like I have to go to the grocery store to stock up on low and no carb foods. I've been eating out following Keto guides, but I don't think restaurants are honest in there nutritional information. I really need help !! I eat on such a system for three weeks, but for some reason I am gaining weight, instead of losing weight .. today I did a test of ketosis, the strip showed 10 ketoses. What I do is not right, I try to lose weight and not die. There isn't- if you follow the provided menus. Not certain where all the hate is coming from about this being a restrictive diet. I threw all the foods listed for the "Eating under 20g of carbs" observed day into MyFitnessPal. The totals for the day came out to 1,590 calories, 10-11g of digestible carbs, 64g of protein, and 145g of fat. Netting 1600 calories in a day when so much of it is fat hardly feels restrictive. Sure, it's restrictive if you compare it to a supersized double quarter pounder meal with a HFCS soft drink, but it *is* a diet. I only wish that there had been some information about whether keeping the carbs under 20g but letting the protein get up to the 80-100g range (about 20% of your daily calories) would also have triggered ketosis. Another reason you might not be in ketosis(this is for when you are already keto adapted): Fructose especially exceeding 2-3 grams of it (and for sure at 5g/day) will hard stop ketosis for until it's metabolized and used (so you will stay out of ketosis for quite a long time if you have insulin difficulties, which you almost certainly do if over 30 or you desire to be in ketosis in the first place) up by your red blood cells and/or brain, fructose has a preferential use by the body in certain amounts after which it is malabsorbed (in everyone, though for some that threshold is quite low) malabsorbed carbohydrates can enter the blood stream intact and cause vein and artery damage due to how sharp the crystals are, your body will then deposit plaque(fats) to seal the wounds and protect the vein walls from exploding/etc and lead to other problems like cardiovascular issues. This is especially important to take note of on high fat diets, berries while excellent usually contain 0.8-1.5g of fructose or so per handful to cup with the other nutritive sweeteners often described as 'carbs' (really they are organic acids with a much lower calorie count than glucose(carbs), and don't necessarily get metabolized into sugars)) but things like say huckleberries you'd be looking at 13 carbs of which around 7-9 are fructose! Raspberries are deceiving as while they are 3 grams carbs it's almost all fructose which means they have 3x as much SUGAR as strawberries (which are 6-7 carbs per 8 oz but only 0.8-1.7 grams of which are metabolized as sugar/carbs/fructose the rest being things like malice acid, sorbitol, mannitol, xylose, oglisaccrides, etc). A single meal/snack dose of fructose is much riskier to exiting ketosis for awhile than other means. Eating too much fructose, glucose, or sucrose will also carb adapt you in just three days, then you will have to spend WEEKS becoming fat adapted again (this is fine if you eat carbs to store up fat only when they would be naturally available to you in the wild, a span of ONLY a few days to weeks in the spring or winter when berries/honey/rose fruit(crab apples, plums, cherries) would be in season naturally. As it's important to carb adapt in the wild quickly as just like becoming keto adapted (through diet, fasting is VERY quick alternative if you have developed the skill to fast for a week or 2 without breaking) there is an immense physiological dysfunction phase when adapting to nonprotien energy sources. The TYPE not quantity of protein more directly influences exiting keto than slow digesting or fiberous carbs (also fiber WILL knock you out of ketosis, as nonsoluable fiber does get turned into nonfat compounds by gut yeast and other fungi, celery and sulfurous vegetables are especially risky for this as they contain large amounts of cellulose and certain compounds these organisms can colonize for several weeks in your gut (or years for some 'gums' without digestive 'events/flushing'). For instance eating certain amino acids more than your body needs THAT PARTICULAR DAY even just a few grams of say phenylalanine or Lucien beyond what you need will behave more like eating sugar and kick you out. This is more risky with noncheese dairy or nonmetal sources of protein. Fish, shellfish and red meat (up to 9 ozs of the former and 4 oz of the latter) should not cause problems, but poultry and nonfatty pork and of course most nonseed nonanimal protein sources(except algae) will quickly kick you out that day though won't make you become carb adapted or anything so you just have to wait 2-72 hours(plant to meat) for the protein mass to be digested and expelled. The exception might be raw meat as it is digested even more slowly and up to a certain protein amount (about 1-2lbs of meat weight raw, up to five lbs for people with full wisdom teeth and completely developed haw(very rare outside of hunter/gatherer tribes and Okinawans), however such amounts are done in a feast manner and no or little food is eaten for several days to weeks after as the protein subsists then through long fasting/famine periods taking a week or two before it passes and preventing protein loss from muscles while fasting. Alcohol: while alcohol is metabolized into one of the ketones it preoccupies your liver and prevents endogenous ketosis and if it takes long enough will ALSO knock you out (but such binge drinking will usually end up with you fasting for several days due to being unable to eat food anyway) this is great in famine situations as things like beer, ale and mead are loaded with vitamins and mineral sparing substances as well as being protein sparing (with exercise like long walks or climbing trees) to a degree during long periods of time without food or adequete clean fresh spring water (mineral, magnesium, iodine, and silica rich water in particular) provided the alcohol is unfiltered with all the mother from the fungi and bacteria. MCTs and omega 3 fats (think eating caviar or fish livers whole/unprocessed, especially cold water cod, or fatty fresh fish like just caught and eaten mackeral, something ONLY a fisherman can do (except in a small town in Japan that has a unique way of keeping them fresh and alive till delivered to certain eateries to be eaten immediately)(though you could also eat meat like snakes or bear as both can be very oily organ meats loaded with it! Insects , worms, and some spiders as well!) directly influence ketogenisis especially in 4:1 diet ratios and can put you DEEP in (4-8 mmol or in my case very quickly 4-16 or more) so must be used very precisely which requires a lot of experimentation and diet balancing (enourmous amount of frankly quite painful to sickening experimentation unless you hit your magic amounts off the bat or just have a good relationship with your enteric nervous system and listen carefully to and follow its feedback (which is actually what all the experimenting teaches you! As your 'needed numbers' change DAILY(or whatever your cycle is if non24). As you can see there is lots of variables, however something more important to note. The article writer failed to realize their initial anount(not the first day but second day) was likely adequate to renter mild ketosis, BUT IT ALWAYS TAKES SEVERAL DAYS at least to renter ketosis once you exit (baring a few genetic exceptions), always. So testing/experimenting daily with changing the amount DAILY tells them nothing they have to eat the same things in the same amounts FOR THREE DAYS each to actually tell if that amount is correct, with an exception being if you get massive results (i.e. Deep ketosis) 4 hours after a meal (or even immedeatly! You can FEEL it in your, let's say liver, when you switch HARD into ketosis without ketoflu). As an amusing anecdote: being in deep ketosis makes you feel similar to being drunk (or rather being drunk makes you feel similar to the immense feelings from prolonged fasting, all due to the acetone/acetotate/acetotetic Acid your brain's gilial cells are feasting on as among other ketones it is the PREFERED energy and one of the most clean energy used by many parts of the brain, some of which can't even function on other exigencies substances! This is a big reason why many animals like fermented food (alcohol is also 7 calories per carb much more efficient than the measily 1.4-4.7 calories per carb the fruit or seed originally had per unit!) as it both generates a state similar to prolonged fasting AND provides a metabolic state great for storing up LOTS of fat for yep you guessed it, prolonged fasting! Of course eating fermented things all the time would be a huge no, short feasty bursts a few days a year only. Essentially OP was eating a very non ketogenic diet, switched to a correct ketogenic diet the second day, then kept going deeper each day without giving each meal plan it's appropriate amount of time and though their preconception bias was correct when 'results' finally appeared, but failed to realize similar results would have been gained from previous/larger amounts had they just been patient, as entering and reentering ketosis require lengthy time on specific macro ratios, though once you are fully in a ketogenic state you actually have a lot more flexibility, especially with deep ketosis. Also as an aside there are some times you don't want to be in ketosis (certain infections where you NEED your inflamitory response to be in overdrive for instance, which keto mildly suppresses, as well as infections where you DONT WANT an energy supply to your body (but you would fast at this time anyway due to how uniquely fasting repairs your immune system, which will put you in a special ketogenic state instead of a nutritional ketogenic state (some very important differences, due to how your liver and digestive system consume resources and filter and combat food vs not having to expend 70% of the bodies resources on combating food and it can focus on repair and eliminating other threats instead) OR WHEN YOU NEED to store up body fat (it's very difficult to store calories from fat as well, fat while in ketosis!) or under certain nutritional deficiency situations where you would have to eat quite a lot of plant matter medicinally. This seems very wordy, but hopefully it answers every possible question, curiosity, and provided a full intuitive grasp about the real nature of this article as well as the real nature and complexities of ketosis. All that drama just to figure out that you were eating too many carb grams? GEESH! BTW-- you don't need to be in ketosis to have success on a low carb plan. I've lost 100 pounds at age 60 with hypothyroidism and no exercise after one year on a low carb plan that includes one or 2 low-glycemic fruits and one slice of Ezekiel toast daily, as well as plenty of greens and seeds as well as an ounce of raw nuts. NEVER had to be in ketosis which is unnecessary and not the healthiest state for seniors with medical issues. Ok, I am scrambling here. I have read this article, I read the article for women over 40 (I am 45), I am using an app to keep a close eye on my macros. For example, yesterday I ate 12g of carbs, 60g of protein and 120g of fat (way more than I thought I had). This has been a typical day for me for weeks and yet when I woke up this morning I was only at .4 mmol/L! WHY? I understand why I wouldn't lose weight with that many grams of fat, but why wouldn't I be in ketosis?!! The most I have been able to get through this whole thing is 1.3mmol/L. I am using a precision Xtra blood ketone tester. I am keeping track of even the most minute possible food ingested. I even put the one piece of xylitol gum on my app yesterday. Why does my body hate ketosis so much? HELP!! I bought urine test strips to see when I’m in ketosis, but after a few weeks, it was enough. I got really dry mouth and increased thirst. Which is very rare for me, so I guess that’s how I know now. And for some reason, I don’t wake up tired when I’m in ketosis. So I wake up in a great mood. This diet does NOT work for everyone. There are certain ways people’s bodies digest things or react to certain foods, but it works great for me. I love pasta, bread, and rice, so I’m only in ketosis a few days a week. PLUS intermittent fasting: I’m losing weight w out even working out. I’m glad that people are educating themselves on nutrition. Great post! I have been fairly strict with my carbs and fats but sometimes go over my protein macros. I am losing weight still but not in ketosis according to my blood monitor. Will a diet drink take you out of ketosis? What about a drink sweetened with stevia? Any suggestions to get myself back in ketosis would be appreciated! Every so often I have felt like I had no energy, despite being fat adapted. 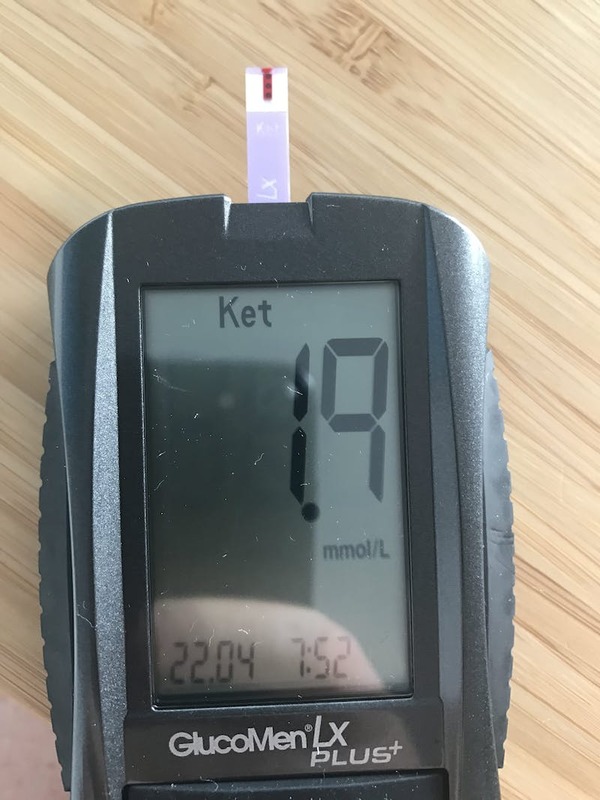 I assumed I was out of Ketosis even though my carb intake was usually under 10 g each day. I learned that fat wasn't the problem. My lack of energy was caused by carbs, even if I ate Keto rolls or pizza, and my weight loss dropped in half for the week. Even cheddar and mozzarella cheese in the amounts included in Diet Doctor recipes (ex. Keto Tex-Mex Casserole) made me gain weight. Either I avoid Keto starches, reduce cheese in recipes that call for it or tolerate low weight loss if I continue eating Keto starches or recipes with cheese. This is a case in point for those wondering why they aren't losing weight or why they've gained weight. The fat contained in Diet Doctor recipes and the starch in Keto pizza and rolls do not work for everyone trying to lose weight, even if they follow the serving amount. keto diet aside.....I would think just eliminating pasta, bread, flour, and rice alone would be enough to lose weight, especially for a carb junkie like me. I was so disappointed when it didn't work out that way. The scale didn't budge at all in a month. Nor did the scale go up when I was eating those things. I don't get it. My weight stays the same whether I eat carbs or not. Perhaps my body would lose weight only with basic calorie restriction (with all foods). Where did you get so much information???? Wow! Did you copy any of it? How long did it take to type all of that? Starving himself? The butter, cream, beef and eggs alone are nearly 2000 kilocalories. The rest will have some too, but those are the main energy sources. You also have to consider what you are using to measure if you are in ketosis. Ketostrips for example only measure acetoacetate (one of the three ketones). They do not measure acetate or beta-hydroxybutyrate (not actually a ketone but kind of regarded as the third). Your body will also start turning acetate and acetoacetate into beta-hydroxybutyrate when you've been in ketosis for a while and thus even though you are in ketosis, your measure will not record it (i.e., turn purple). When I wake up, I'm in low-level ketosis based on a simple keto strip. Not great, but better than nothing. I then have two cups of coffee with one Sweet 'n Low packet per cup. I'm IF'ing until noon. I grab another strip and pow, I'm only in trace or completely out of ketosis. I have no idea what is causing this when I'm not eating. I can't seem to find my issue on any forum I look up, hoping someone could shed some light for me. on here Seems everyone is trying to reach ketosis and I'm having the opposite issue, I can't seem to get mine lower. I knew I hit ketosis when I started experiencing dry mouth, and many other symptoms. However, my ketone levels according to some experts are too high and and I won't lose weight his way. I'm anywhere between moderate to high. I've been drinking a a lot of water, a lot of electrolytes, sodium, you name it I'm doing everything right! And no I am not diabetic. Help?? sweet n low. check out Dr. Jason Fung on youtube. He talks about sugar subs & how they trick the body into thinking it`s getting sugar which leads to a domino effect on hormones. IDK for sure but might be a possibility? It's not always about weight loss. I am 5'4. I was 127lb (not fat) and lost 10lb (looking fab), but what most important is that i lost my horrible night sweats (would wake up 2-3 times at night drenched in my own sweat.. and i'm just 43 y.o. ); lost joint pain; lost depression (!!!). It's soooooooooooo different when your body runs on ketons vs glucose. It's a whole other game and a whole other feeling. When i'm in full ketosis, i experience pure JOY throughout the day and have energy... and no brain fog. In the past month, without really realizing it, i started consuming more carbs than i should. When i tested my ketons level (because i started getting my "lost" symptoms back), i was in shock - zero. Now i'm back to hard work of getting on track and staying on it. Glad i found this article.. because i started to blame protein too, but i just can't consume tons of veggies - they never agree with me and make me feel miserable (even though i do love the taste). I am 53 year old woman have had uterine cancer and gained weight after medically induced menopause ever since I had a complete hysterectomy I am now trying the keto diet I'm trying really hard to figure this all out but I'm still confused I need a meal plan specifically for me just tell me what I have for breakfast lunch and dinner and healthy snacking I typically like to snack all day while I'm at work nuts peanut butter whatever. What do I do to get me in ketosis I weigh 122 lb and I'm 4 ft 11 in tall and would like to lose 10 lbs quickly can you help? Hi Dianne! We have recipes and meal plans here on our website! No customization needed. You will probably want to give up the snacking, especially nuts and peanut butter as they can be higher carb and legumes can contribute to inflammation. So is this article saying vegetables are bad but protein is ok? I did diet doctors and lost 40lbs following the recipes exactly. Still very low carb and haven't lost a thing in months. I do occasional monk fruit or stevia in my coffee and lemon water, I believe it may be the culprit. Blood keto meter always reads 0.0- 0.6. I usually test first thing in the morning. What was suppose to be easy seems to be hard. 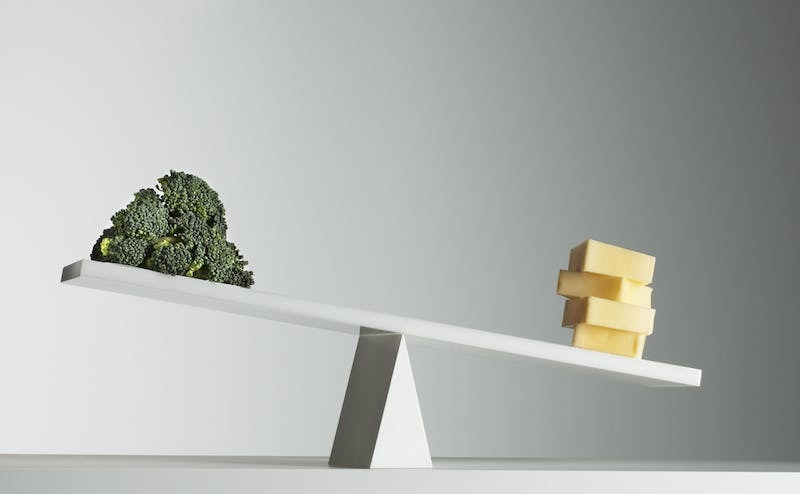 I eat a lot of cheese, which I thought was good, but now I'm questioning it, as well as broccoli and other leafy vegetables. I do IF a lot, but still have trouble reaching ketosis. Vegetables are fine, it's just important to keep an eye on serving size. Try the experiment listed in the article and see how it affects your ketosis. As for the lack of weight loss, check out this troubleshooting guide. I’m a keto newb and I just want some clarity...I thought 20-50g of carbs is okay? How is 30g of carbs the reason your not in ketosis? Different people come to keto/LCHF with different metabolisms and different levels of insulin resistance, among many other factors. Generally, LCHF is 20-50g carbs, but most do need to be under 20g to see ketosis. You're absolutely mad if you think you were overeating carbs. I have been counting my carb in take on carb manager app and getting 12-20 a day. I have BP coffee, heavy whipping cream with 1 carb per 2 tablespoons then fast till dinner, ribeye with fat and butter then butter veggies 4 carbs, and a nut snack of 5 carbs daily or a fat bomb with 3 carbs and only .5 blood meter. I do intermitten fasting 4xs 7 day week. I get 80-120 g of fat and 30-40 protein. I am a new bee and I really need help. On some pages it says eat arounf 72 gr of protein but here it says eat less than 60 gr. what is the optimal for 1300 calories intake? That is going to vary! Rather than tracking by calories, keep carbs 20 or less, protein 45-60 (for a woman) and make sure you're getting more fat than protein! I am a newbie and need some help. I cannot get into ketosis. I use carb manager and track everything. I have less than 20 net carbs per day. Most days my carbs are 13. I use no sweetners. My protein is around 60 and my fat intake around 80. I use the ketone strips and it never goes up. I will try increasing water intake and exercise. Anything else I can try?? I want to lose 20 lbs! everybody outside America/ UK practically thinks in grams. I have no clue how much an ounce is. I have to always look up converters when cooking an American recipe. try intermittent fasting a couple of days a week. That might do something. Same!!! Did you figure it out? I’ve been under 20 net carbs for thirty days. I have barely ever reached 1.0 mmol and more days than not, I’m .5 or lower. I’m not losing weight either. Im so frustrated. I'm well into ketosis before I go to bed. In the morning when I wake I am out of ketosis and haven't eaten a thing. I am only loosing a half pound a week. I keep my carbs at 8 and my protein at 55 my fats are 80 to 110. I need HELP, I have lost 15 pounds in 3 months. I am down to 210. You can read our top weight loss troubleshooting tips here. Do you have the link to that video, please? I appreciated this article. Been doing keto for 2.5 years and it is easy to experience this creeping up of carbs. Although that is low carb, there are a few potential troublespots. That is higher protein and lower fat. With keto we want the high fat. Additionally, the artificial sweeteners in Splenda and Crystal Light can definitely be inhibiting ketosis. You may want to try our free two week challenge to get an idea of what well composed keto meals look like. I have been eating 15-20 gms carbs, 89 gms fat, 69 gms protein. I document every bite I take.....why am I not in ketosis? How long have you been eating keto? How are you testing? The urine strips don't seem to be very reliable.